Public, private, and charter schools may order the hardcover school version of Grammar and Writing, which is available exclusively to schools and is distributed only by Hake Publishing. 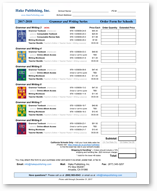 We accept school orders by email, fax, or mail. For your convenience, you may open and print this Grammar Books Order Form. We are currently accepting schools that are interested in a one-classroom pilot. Please contact info@hakepublishing.com for details. The homeschool edition of Grammar and Writing 4-8 can be ordered from Saxon® Homeschool or from your favorite homeschool distributor. Grammar and Writing 3 for homeschool is available directly from Hake Publishing (through HakeHomeschool.com).